One of the best burger joints in Vilnius, Drama Burger presents a mean brunch on weekends. The Drama Breakfast, a scrumptious combination of chorizo or black pudding with sides of avocado salad, bacon, eggs, toast, and beans, is the heartiest offering. The omelets are filling, with your choice of smoked salmon or chorizo. Beverage options include Bloody Mary, tea, coffee, and fresh juice. Find Drama Burger on Gedimino Prospect near the former KGB building. During summer, outdoor seating is available. The casual, cozy interior is rarely empty. Sonnets Café is decorated with comfortable furniture, leafy foliage, and warm woods. Brunches here range from a typical English-style breakfast to a skillet breakfast with eggs, bacon, and sausage. Smaller menu items, such as oatmeal, are available if you aren’t feeling too hungry. 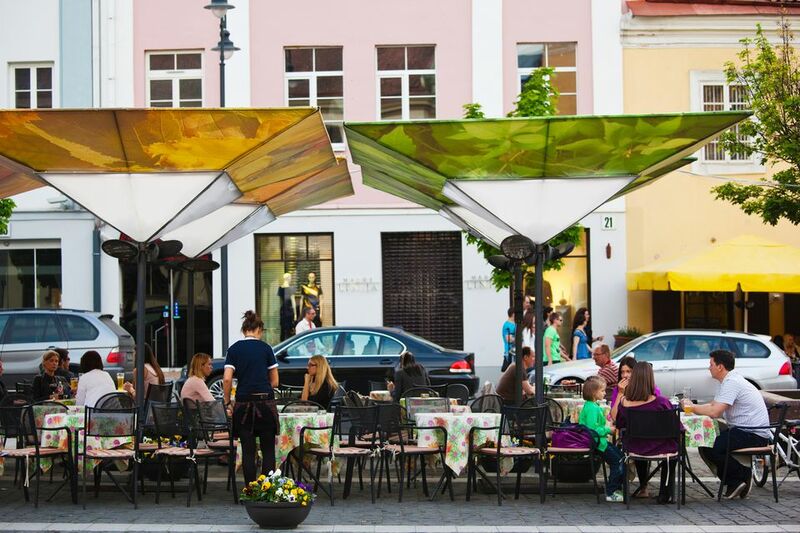 The restaurant is located on the second floor of the Bernadinu Street hotel, right in the heart of Old Town Vilnius. The tables are large and the atmosphere inviting, so it’s a good venue for a group of friends. This small bakery is almost always packed, and in the summertime, it opens its glass front so that patrons can spill out onto the terrace on Pilies Street, the avenue that runs from Gedimino Castle Hill and Cathedral Square into the historic center. While the café is best known for its bakery, it also offers omelets and other breakfast items. Mano Guru is tucked away on Vilniaus Street. A popular weekend breakfast and brunch venue, its menu, though in Lithuanian only, seems neverending. Fresh-squeezed juices, bakery items, fresh fruit, and eggs and sausage fill the menu in every combination. As a bonus, on Sundays, it hosts a cheese market from 10 am to 1 pm, where artisanal cheeses and other local products can be sampled and purchased. Weekend brunch or breakfast for vegetarians can be had at Vieta on Ignoto Street. This tiny, rough-around-the-edges café has only a handful of tables, so getting a seat may be serendipitous at peak hours. During other times of day, the café serves an ever-changing menu of vegetarian fare including cheese that comes hot and bubbling from the oven. Cozy is open for breakfast every day of the week and is located not far from Vieta, on the corner of Ignoto and Dominikonu streets. Choose from English-, French-, or classic-style breakfast or a generous selection of a la carte offerings, including eggs, oatmeal, yogurt, and pancakes. It’s a good go-to place before sightseeing or if you have an early-ish flight out of the city. Café Montmartre is located near the Town Hall and by day is one of the various French restaurants that populate Vilnius. Choose from crepes, waffles, eggs, or French-style breakfast.